All Inn Suites, in our country hotel, have full kitchens, full baths and lake views. Available in Junior, 1 or 2 bedrooms. All non-smoking. Sorry no pets in the inn. Each of our private seven inn suites are waterfront!! Junior, Blue Heron & Seguin are second floor walk-ups. 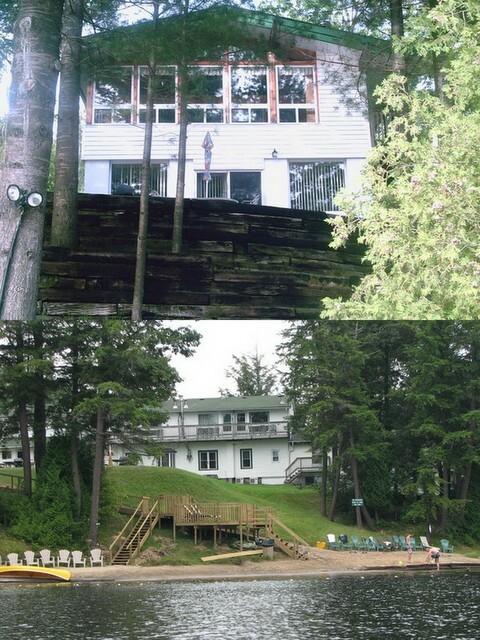 Enjoy the privacy of our waterfront inn which is a great alternative to a hotel in Parry Sound or any where else! Pay the going rate for a hotel room and get a hotel efficiency suite with a kitchen and a million dollar view of the lake from your balcony! flat screen 32" tv's in the Junior suites, the Georgian and Blue Heron. Hurry and book your holiday or nightly stay as we only have seven suites to rent in our waterfront hotel. Three are Junior Suites which are 2nd floor walk-up hotel style rooms with a full kitchen, full bath, satellite tv/dvd/vcr, wireless internet, queen bed, dining table for 2 and balcony with an outstanding view of the beach and lake from the second floor of the Inn. Off Season Rate $125; peak rate $179. Maximum 2 people. bath, and sitting area. The main room has a full kitchen, 2nd full bath, pull out sleeper sofa, love seat, satellite tv/dvd/vcr, dining table for 4 and balcony overlooking Otter Lake & the beach. Off Season Rate $165; peak rate $265. Maximum 4 people. There are two very large two bedroom suites in the inn at the point of the lake. Both have full baths and kitchens and have wood stoves. The Rosseau is a level entry unit & has a main floor walkout with huge living room and windows on 3 sides with great views and a walk out patio overlooking the lake with private gas bbq and patio set. It has a queen bedroom and a bedroom with 2 singles. Living room has a sleeper sofa, love seat & chair. Full kitchen & dining table. Suite is only about 50 ft to the lake! 2 Bedroom Rate Off Season Rate $215 peak rate $310. Maximum 4 people. The Seguin has both a very large living room and a bonus "Muskoka" room with windows on 3 sides; it gives a great view of the lake and a quiet area to get-a-way within the suite. It has two queen bedrooms with one having a bonus loft single bunk which the young kids love. Living room has a sofa, love seat and chair. There is a full kitchen and dining table. Same rate as Rosseau. Maximum 4 people. Note to guests: our Junior Suites, Blue Heron and Georgian have wall mounted non functioning fireplaces. In 2016 our insurance company required a WETT inspection to certify the safety of the fireplaces. Due to the age of the inn and the inability to examine the construction and installation we were unable to pass the inspection with our fireplaces. These are no longer able to function and may not be used to burn wood. Our larger 2 bdrm suites have wood stoves. The inn is just steps to the beach, picnic areas with gas bbqs,swimming areas, water trampoline, water slide, docks, free use of canoes, kayaks, paddleboats, paddle boards, row boat and rental motor boats.